The MediLuxe Rx4-2000 is a deluxe power exam / treatment chair with a host of specifically designed features for use in multiple positions that apply to a wide variety of treatment settings, including physician offices, med spas, day spas, destination resorts, and concierge medical offices. A hand wand or optional electric powered foot pedal adjusts the elevation to the perfect working height from 24” to 34”. The lift-back section smoothly converts from a full-recline table to a seated examination chair position in seconds. The Rx4-2000 Office Procedure Table is one of the most attractive treatment tables on the market at an affordable price. The Rx4-2000 is a medical grade procedure table with many applications in many specialties. It is stable, comfortable, and highly positionable . The Rx4-2000 swivels. This 240°side-to-side rotation is specifically designed to enhance and optimize your workspace. The Rx4-2000 medical procedure table has for separate motors which control height, backrest, and footrest and seat incline (Trendelenberg). The armrests flip back 180 degrees, and can be removed, and the headrest is adjustable. The high quality upholstery feels great and is easy to clean. Headrest and leg rest are removable and can be extended by 4"
Delux adjustable headrest with face hole for prone and supine use. Removable Side Rails for stirrups and other accessories also available. See drop-down menu above. 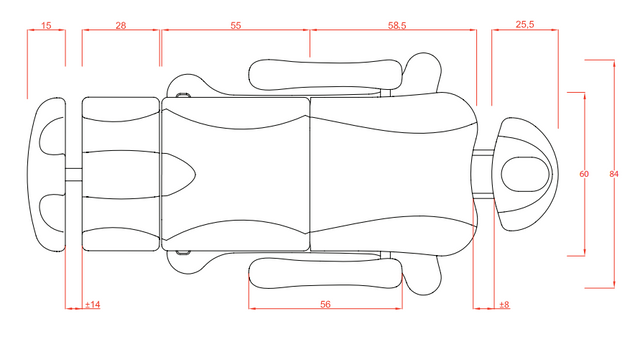 Flat Chair Height (Minimum): 24"
Functioning and operation of The Armrests will automatically move with the table as it goes from table to chair position, and then back again; they remain parallel to the floor. In the table position, armrests become flush with the top surface of the table, and widen the table at the shoulders. In the chair position the armrests function as armrests. The armrests are also easily removable, and also in the table position can be lifted up (pointing toward the ceiling), and moved out of the way, so that you can move closer to the client, and for entry and exit. Thoughtful design, beautifully functional in many ways. FOOTPRINT: front is 25" sides 40" back 31"
Comes Pre-Assembled. Ships Free -- Free shipping included with your purchase.